The meetings took place on Monday the 29th of August 2016, at the Masses’ House, 28A, Erie Street off Sokponba Road, Benin City, Edo State, also the operational office of Social Action’s Open Budget Cluster member organization, Edo Civil Society Organization. 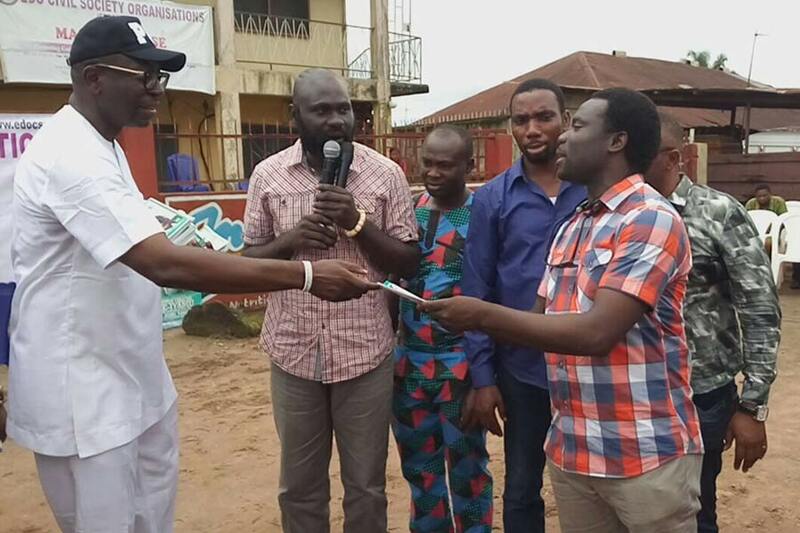 The People’s Democratic Party Candidates Pastor Osagie Ize-Iyamu had the first appearance. At the meeting, the candidate responded to a range of questions bothering on good governance, infrastructure, employment, etc. Social Actions Ken Henshaw on behalf of participants at the event asked if the candidate will commit himself and his party to ensuring that the practice of Open Budget which include transparency, citizens participation and strong oversight will form a part of his fiscal policy if elected governor. In his response, the candidate said if elected governor, the state budget process will begin with large town hall meetings in all the local government areas of the state, where the opinion of all citizens will be sought and included in the budget proposal. He further said all fiscal documents will be made available and open to citizens while there will be fiscal provisions in the budget for civil society organizations to monitor state government expenditure. Social Action Commends Delta State for Choosing the Path of Transparency.